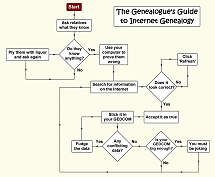 I've whipped up a flowchart that lays out in the simplest of terms how genealogists use the Web. It will appear in the appendix of my forthcoming book, Internet Genealogy for Complete and Utter Morons. Liqour! Why didn't I think of that? Thanks for the laugh, chris! LOL! that is funny! I love it and sending a link to the genealogy dept. here to give them a laugh as well! This is just hilarious! Thank you for making me laugh tonight! I would naturally give you credit with a link to your blog. Sure, Michelina. Thanks for asking first!